A child born with a cleft lip in South Sudan often faces a lifetime of misery. Many people believe that the facial deformity is the result of a curse. Children are mistreated, prevented from going to school, and shunned as though they had a contagious disease. Many young women never marry. A cleft lip can be repaired through a surgical procedure that often takes less than two hours, but people who live in rural villages rarely have access to medical care and have no idea that the “curse” can be lifted. Samaritan’s Purse helped change the lives of 78 cleft lip patients in October by bringing a team of American surgeons to Juba Teaching Hospital in South Sudan to perform the operations. The patients, ranging from 3 months to 60 years, came from towns and villages across the country. 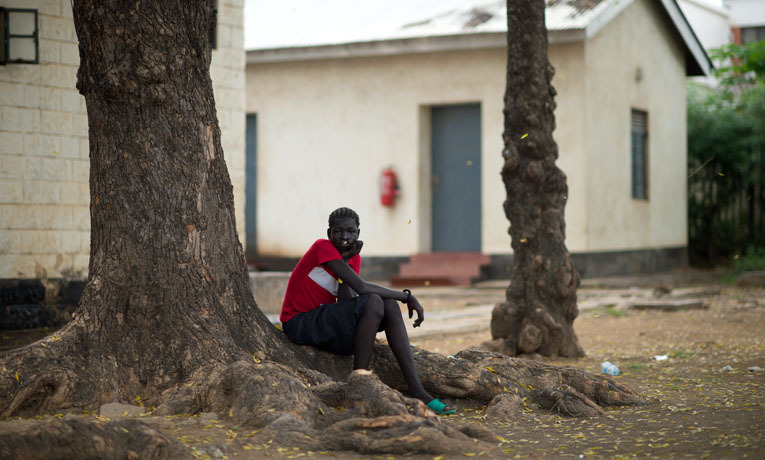 Those who lived in distant villages were met at tiny airstrips and flown to Juba, the nation’s capital. Few had ever flown before or ventured so far from home. Many patients were strangely comforted when they settled into hospital ward #2 and met so many others who looked like they did and understood the struggles they faced. It was a revelation to know that they were not alone. Dr. Chuck Miller, a retired pediatrician from Delaware, did pre-op exams to make sure that every patient was healthy and ready for surgery. The 82-year-old physician said he had an intuitive way for diagnosing children. Dr. Miller postponed the surgery for a 2-year-old boy named Yousif who had complications from malaria. “If he hadn’t come here for the cleft lip surgery, I’m sure he would have died out in the villages,” Dr. Miller said. A unique surgical theater was set up where three patients could be operated on at the same time. One or two surgeons attended to each patient, while the medical support team coordinated operating room activities for the group. The surgeons were able to complete 78 procedures in eight days. The team included Dr. Tom Boeve, an otolaryngologist from Virginia who serves as a medical missionary at Kijabe Hospital in Kenya. He was on his second trip to South Sudan with Samaritan’s Purse to do the cleft lip surgeries. Dr. Boeve was called into the operating room where his next patient, a 13-year-old girl named Huda, was under anesthesia and ready for surgery. Using violet-blue surgical ink, Dr. Boeve carefully made a series of dots and thin lines on Huda’s upper lip as a guide for his scalpel to follow. When he was satisfied with the blueprint, he confidently made a series of incisions into the tender flesh that only a surgeon would dare. He moved quickly into the next phase of the repair, carefully stretching, folding, and stitching the flaps of skin into place. It was like watching an origami artist at work. Soon, a new lip, with all of the delicate curves and lines in place, took shape and a mouth that was once twisted and deformed looked new. As patients began to return to the ward after surgery, everyone was astounded by the transformation, easing the fears of those who were waiting for surgery. Still groggy from the operation, patients didn’t realize how much their appearance had changed until they had a chance to look in a mirror. Many stared quietly in disbelief. Others tried to laugh and smile through the stitches. Parents were thrilled to see that the “curse” had been lifted from their child’s life. Miriam, a woman with 20 grandchildren, was the oldest patient. She had lived with a disfigured face for 60 years. She looked at her reflection and touched her tender lip. The father of a teenage girl named Amiri was grinning proudly and giving the thumbs-up sign to the medical staff. The Dinka cattle herder was pleased that his daughter would attract a husband and bring a good bride price. One young mother had tears as she looked at her daughter’s face. Markos sat on the edge of the bed where Yousif was sleeping and thanked God for a triple blessing. After his son survived a brush with death from malaria, he had the cleft lip surgery that gave him the promise of a new life. It also brought healing to their family. Across the room, Asamaki cradled her 6-year-old son, Jadia, in her arms with a new sense of hope for the future. During the patients’ stay at the hospital, members of the cleft lip team prayed with them and shared the Gospel, with assistance from South Sudanese chaplains. Several people accepted Christ, including Miriam. She waited 60 years to get a “new look,” but she also received a new life in Christ.